HOLIDAY HOMES, HOUSES & COTTAGES TO RENT IN CORNWALL, ENGLAND. 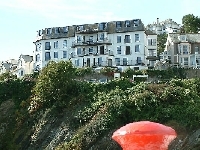 Welcome to our selection of holiday homes to rent in Cornwall, England. Cornwall is an historic region of South West England steeped in history and legends dating back to the pre-Roman and Celtic inhabitation of this three shored area of: The Atlantic Ocean; the Riviera Coast and The Far West. There are 140 beaches on these shores and some are blue flagged - which is the esteemed European award for clean and environmentally friendly beaches. Besides relaxing on its temperate beaches, a visit to some of the most reputable tourist sights is a must with the Eden Project - the world's largest greenhouse encased in what seems like huge golf balls buried on the Cornish terrain. Another is the beautiful estate of The Lost Gardens of Heligan, set in a large area of land given to some of the most fascinating displays of garden landscape. If you are more mythically minded than environmental - explore the legends of King Arthur in the factual Tintagel Castle. Cornwall, the seat of Wessex, legends and groundbreaking projects is also the most megalithically endowed county other than that of Wiltshire - the county of the great Celtic magical gateway of Stonehenge. It has also been important for its production of tin, which catapulted it into the Bronze Age, and later its iron deposits, which helped fortify its many Iron Age hill forts of which some still remain. Other than its neighbouring county of Devon it is one of the most enjoyed tourist hotspots, which will forever perpetually reside in the memories of all its visitors. Looking for self catering holiday accommodation in Cornwall? then below is a selection of houses, holiday homes, flats and holiday cottages in Cornwall that can be rented direct from their owners. You can either click on each listing for further details or you can use our search engine on the left if you are looking for something in particular. Here you can find useful links for attractions and businesses in Cornwall including links to The Eden Project, China Fleet Golf and Country club and Harlyn Surfing School.